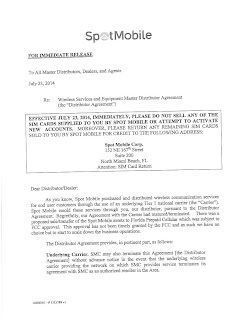 It looks like T-Mobile MVNO Spot Mobile may be winding down operations. Dealers received a letter from the company yesterday asking then not to sell or activate any Spot Mobile SIM cards and to return all unactivated SIMs to Spot for a refund. 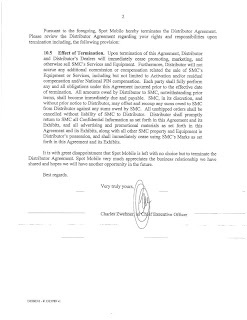 The letter, says in part, "As you know, Spot Mobile purchased and distributed wireless communications services for end user customers through the use of an underlying Tier 1 national carrier (the "Carrier"). 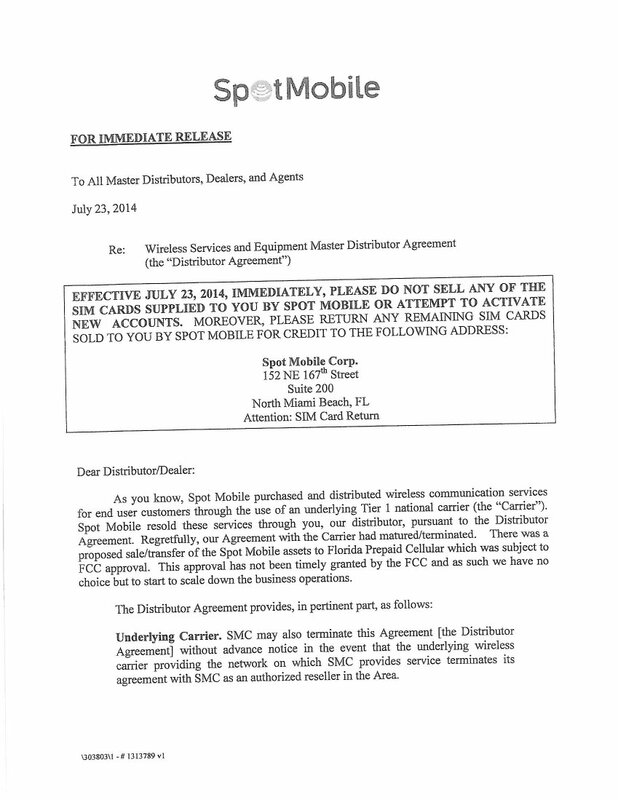 Spot Mobile resold these services through you, our distributor, pursuant to the Distributor Agreement. Regretfully, our Agreement had matured/terminated. There was a proposed sale/transfer of the Spot Mobile assets to Florida Prepaid Cellular which was subject to FCC approval. This approval has not been timely granted by the FCC and as such we have no choice but to start to scale down the business operations." 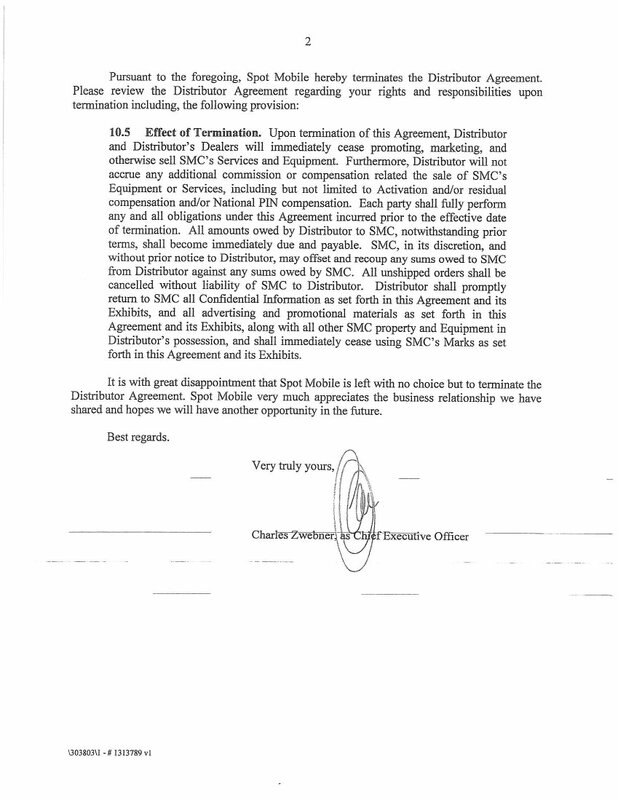 I received identical copies of the termination letter from multiple Spot Mobile dealers and believe it is genuine. When I called Spot's main support number I was told that Spot is not shutting down but is undergoing a "system update" which has temporarily prevented them from activating new accounts. Hopefully this means that Spot will be able to keep current customers' service active while it gets FCC approval for the proposed sale to Florida Prepaid Cellular or finds another buyer. Spot was founded in 1986, making it one of the oldest prepaid MVNOs. Spot's plans and pricing have been competitive but the company never seemed to gain much in the way of visibility. If they are going out of business this is sad news for Spot's customers, dealers, employees and investors. The MVNO business has got to be a tough one to be in. It's probably tough enough for Tracfone so one could only imagine the challenges a smaller provider faces. Margins are slim and customers demand gold support while only willing to pay the least amount possible. Tracfone probably depends on high volume and low churn for any kind of profit whatsoever. I bought a SIM a week ago that I have not yet activated. I hope that they do not fold up. We consumer need to have competion in the industry. I still have 2 Pre-funded Spot Mobile sim card not activated, does this means that I can no longer activate them and need to return them to the address listed above? I also have one of them . Now I know why the price was low I am guess the seller knew what was about to happen. The address in the letter is for dealers. I recommend calling Spot first. Darn, Spot was a great place to park your number on the $5 paygo and why I picked up a few extra SIM cards. Well, I guess I can stack those next to the old Lyca SIMs. They do make good tidily winks if you are bored. ring.to is good to park phone number. Because of customers like you Spot is out of business. That's weird, they are still taking orders on their website, for Sim and plans, like nothing happen. Spot CS told me that customers can still add airtime but new accounts can't be activated so it is strange that SIM still appear to be available on the Spot Mobile site. You are right, they still offer plans on line to new customers, I went thru the process of ordering a sim and plan and got all the way to enter payment, which of course I didn't, however, if Spot is selling products knowing that they are going to shut down and wont be able to provide service, it is considered fraud and cannot be wiped out in bankruptcy court. Yes, I remembered buying a $5 plan just to port from one company and off to the next. Gonna miss Spot. Wonder who is next? Blackwireless? Go Smart? Simple? Ultra? Any MVNO is in danger of going under, however Go Smart, Cricket, Boost, Virgin, Etc, are NOT MVNO's they are part of the carriers themselves and as such highly unlikely to shut down overnight. I wonder why another T-Mobile MVNO (or even T-Mo themselves) doesn't step in to acquire Spot's customer base, if Spot shuts down they can get them for free. T-Mobile might require them to assume Spot's debts. What a bad timing. I did a refill yesterday and now I'm reading this. Anyone knows whats is the account # and PIN that Spot Mobile uses for a port? I hope you used a credit card for payment. If you refiled yesterday and if Spot is shutting you are entitled to a pro rated refund. Yep, I used a credit card but the refill was with calligmart. Your account number is your sim number and pin number is the last 4 digit of your sim number. Hope it helps. I heard from Master dealer The New Owner already take up. But still have a trouble with T mobile & Old owner about payment. So currently T-mobile shut down the Spot mobile reup. Wrong. Refill, sales and new activations on Spot's web site still works as usual. Refill and sales do seem to be working on the Spot site. However the submit button on the activate web form is disabled and labeled "Temporarily Unavailable". In addition Spot customer support told me that they are unable to process activations at this time. First off, Spot was not founded in 1986....it was more like 2009. It does appear that they are on their way out because most of the national POSA providers have removed products from their systems so there is no way to refill at retail locations anymore. I got the 1986 date from Spot's Bloomberg Business Week company profile so it's likely based on SEC filings. I don't know how long it's been operating as a prepaid MVNO. If you are a spot mobile master agent and your dealers are angry with whats going on with this MVNO then contact me and I can help you with porting your dealers customers fast, easy and no headaches. I represent several MVNO's and I am here to help you thru this transition. Remember the Next G fiasco? I ported 1000's of numbers in hours. Your Dealers are your lifeline so contact me so I can help you help them.